You are currently browsing the tag archive for the ‘Self-mocking’ tag. A mockingbird perched on the tender top of a cypress tree, avian witness to my morning of frustrations, plans gone wildly awry. I snapped its picture, groping for hope, for beauty, for something of meaning before I set off toward home. Partway there I spotted a tree and stopped to investigate its colors with my Canon. In the midst of this, from a black and white bull standing in the field, came the sound that said it all. It was a moo that morphed into a growl. (See my prior post.) As if the universe were reflecting back to me, in perfect symphony, my grief and gnarly edges. Later, near to home, with some understanding now of the reasons for the crossed signals and muddled plans (He thought I said what? That’s not at all what I meant. 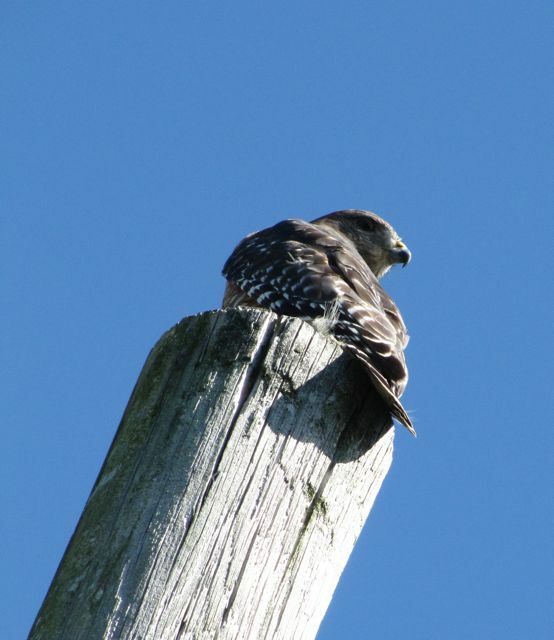 ), I spied, standing tall on a telephone pole, a lone hawk. I passed it by on the highway, backtracked, then pulled as close to the pole as I could without chasing my totem away. I decided to chance it, pulled closer still, moving to the other side, where the bird was lit by the sun. Watching me, the beaked hunter turned and looked down. We met for a moment through the lens of my camera, and then it took flight. Then gratefully, gracefully, taking wing with the hawk.